We’ve all been there. You are in the car for a trip around town or to another town and you need an activity to keep your kids quiet and engaged. Or maybe you are waiting in line at the grocery store or doctor’s appointment. 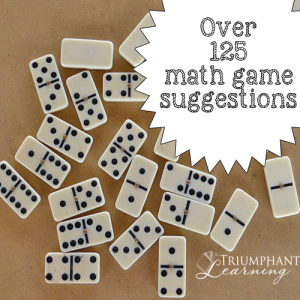 Turn these times of waiting into learning opportunities with these fun math games to play in the car (or plane or train or line). They require no supplies and can be adapted for all ages. To help you remember these games when you are out and about, download the free PDF with instructions for all of the games. Fold this one page printable, stash it in your purse, and the next time you are waiting you’ll have a secret weapon ready to go! Count anything and everything. This is a great game for younger children and those learning to count to higher numbers. You could count green road signs, blue trucks, cars, or cows. Count items as a team or play a game to see who can find the most of whatever item you are counting. Modify this game by counting forward, backward, or skip counting. Give your child a word and have him tell you the opposite. Some examples include: hot/cold, up/down, angry/happy, and considerate/rude. You can make this more challenging for older children by using more difficult word combinations including ones that are abstract concepts. It may challenge you too as you think up word combinations to stump your older child! For a twist, see if they can stump you. This game can be adapted for any age. Think of a number and have your children guess it. You can give a range in which your number falls or make it more challenging by not giving a range. When your children guess a number, tell them if the number is higher or lower. My number is divisible by (2, 5, 10, 25). My number is equal to two quarters. My number is the square root of 2,500. This game is similar to Guess My Number, but instead of trying to guess the number you try to guess the rule. For example, if your rule is to multiply by 10 and a player says 37, you would answer 370. Choose (or have your child choose) a descriptive quality such as green, fits in a shoe box, rolls, has wheels, or is a mammal. Then work together to identify items that have that quality. For example, if your descriptive quality is “has wheels” answers might be car, wagon, bike, roller skates, scooter, or train. You can make this game more challenging by choosing a descriptive quality that is more abstract such as blows in the wind, makes me happy, or requires electricity. Choose three items, two that share similar qualities and one that doesn’t. Tell your child the three items. Have him guess which one doesn’t belong and tell why it doesn’t belong. You can make this more challenging by trying to figure out how every item does not belong. We’ve not been stumped yet although a few were difficult.